A single or combination of Beta beat representing the heartbeat. 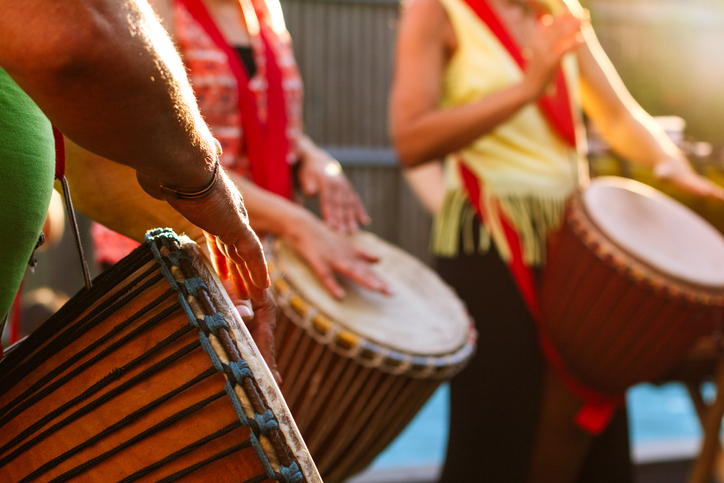 Drumming circles are cross-culture and multi-ethnic modality dating back 30,000 plus years. Science has linked how a particular frequency of the drumbeat increased the alpha brainwaves, which are associated to feeling of well-being and euphoria. Over the past I have been a host for an Indigenous Clan from central Mexico, with the vision of bring 8000 drums together to heal mother earth (heal humanity). In that journey we were part of healing drum circles in La Push Washington (and others). The Queleute Tribe started holding Healing Drum Circles (bring them back) when there was an increase in substance abuse and members of the family abandoning family and tribal values. The Healing Drum Circles returned the pride and forgiveness of past actions. In turn returning and elevating the Queleute Tribe original values. I’ve also read and seen these changes in the Canadian First Nation Tribes. Where substance abuse was destroying their clans and yet the Healing Drum Circle (and sometimes teamed up with AA) eliminated addiction from the Tribes. For the past 15 years I've been hosting healing circle (sound, drumming, ceremony, dance ....) and understand change takes time and yet if we can scratch the surface and bring unity of humanity under understanding and compassion. That will be a win. My vision is that each Tent City in Seattle and King County have a healing drum circle and that when the time opens, that we all unity on the same day(s) at the same time. Singing the Sam song, and holding the same drum beat. The Heartbeat of unity woven in a life style of go go go. Take a moment and remember our breath of life and life of breath. My proposal is to hold a Healing Drum Circle each night a week from 7:30 p.m. - 9:00 p.m.